As a little girl, I was a total doll-lover. I had a plethora of dolls, but a few were standouts: I had Vicky, whom I got when Jenny was born, I had Jenny-doll (who I told my parents to name Jenny for), whom was bought with money from my mother's grandmother, who passed before I was born. And, I had David, named for my grandfather, he was my only boy doll, and I adored him. I had a doll with me wherever I went, and to me, they had such spirit, and were truly alive (hence my amazing love for all the Toy Story movies...). So, when I found out I was having a son, I'm going to admit, honestly, I was bummed that I wasn't going to be able to play dolls with him. I mean, our culture is so into boys-being-boys, that I have to admit, even this proud feminist mama played into that concept (blame it on pregnancy hormones), and I was sure that I would have to wait until we would maybe have a daughter someday to indulge in my doll playing. 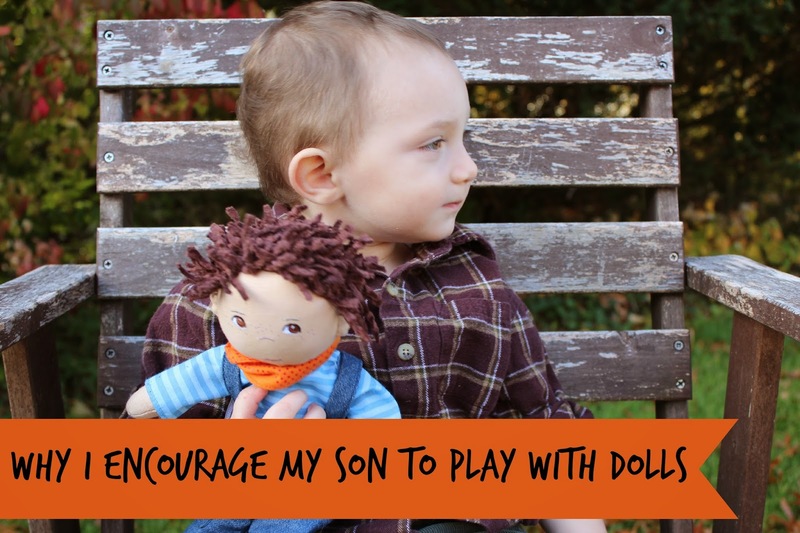 I mean, the only experience I had with boys playing with dolls was the book we had, William's Doll, in which William loves his doll, but gets teased for being a boy and playing with dolls. Granted, it is from the 1970s, but, I don't think much has changed in terms of teaching "boys to be boys" since then. But, when Weston was born, and I saw how truly loving of a spirit he is, I decided to buck the societal concepts, and buy my son a doll. Weston was four months last Christmas, and I decided to buy him one special doll for his first Christmas. 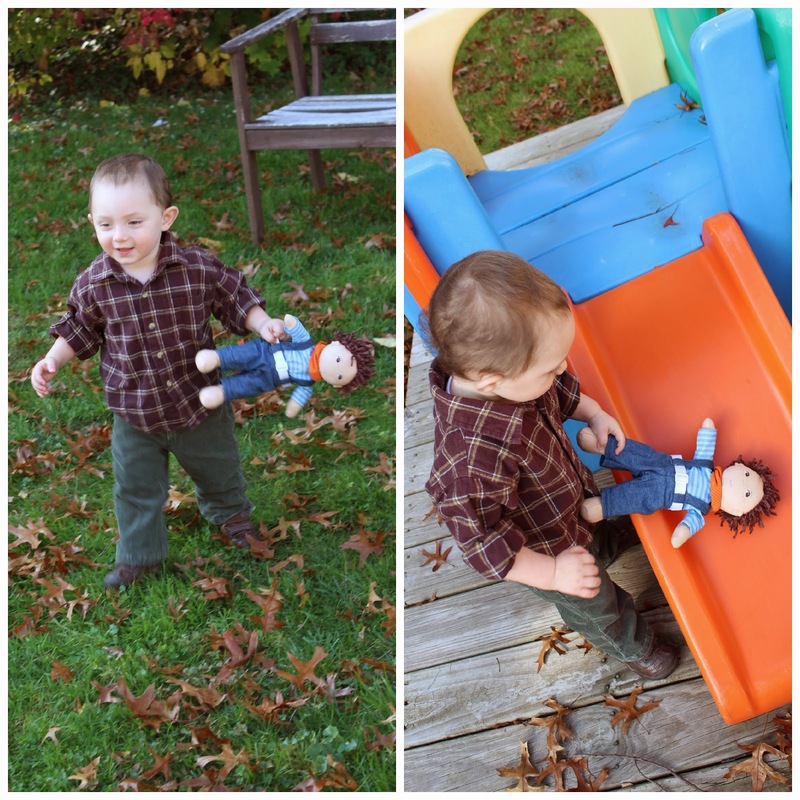 I searched and searched for "boy dolls" online, and finally came to the Haba dolls. I fell in love with Graham, as he looked adorable, was soft bodied, and had a cute smirk on his face, just like Weston. Weston was really too little to open presents last Christmas, but we renamed Graham, "Huck" (for Tom Sawyer and Huck Finn), and kept him around the house for the past year. Just a few weeks back, Weston started really recognizing his stuffed bear, and cuddling with it at night. When we were playing, I would have Huck play with us too, and do the things Weston was (dance, eat, play banjo). Weston started to recognize that Huck was a playmate, and we would make him laugh along with us, bring him in the car, and cuddle with him. I began calling Huck, "Weston's Baby," and told Weston that he was a daddy, just like his daddy! Weston would hold his "baby," and cuddle him. The real clincher came when I told Weston to "put baby to bed," and Weston laid the baby down on a pillow, climbed on the floor next to him, and put his arm around his baby. See, that's exactly what we do to put Weston to bed. We lie with him and cuddle until he falls asleep...Weston was 100% mimicking what we do with him, in his relationship with his doll. I started to tear up with how sweet is was! In this past week, Weston has put his baby to bed many times, put him in the high chair to eat, helped him down the slide, read to him, played music for him, and...when I pretend to make the baby cry, Weston holds him, with a hand on his head, and a hand on his back, and rocks him. We're told as parents to make sure we read to our children every single day or else they may become delinquents. We're told to have them not watch television. We're told to keep the iPhone, iPad, and screens away from them. We're told a lot of things. It's overwhelming how much we're expected to teach our little ones in order to help them become "good people." But, no one, in any news media platform, spews information on teaching our children to become empathetic, loving people. Yes, books help children learn language, but what about the language of love? Why are we keeping our young boys from learning how to be good fathers...or you know, just nice people? When I decided to buy Weston another Haba doll for this Christmas, I wanted to get him some baby-accessories for his dolls, and low and behold, all of the accessories were pink, pink, pink. Not that I mind buying him pink toys, but why are we still living in a world where dolls are a toy in the "girl's toy aisle"? Why is it okay for boys to play with guns and not baby dolls? Like any other parent, I want my son to become a strong, moral, and kind human being. But, he's not going to learn to do that on his own, nor will he learn it without modeling, examples, or teaching him how to be kind. We must engage our boys in a world of empathy by showing them that it's wonderful and healthy to show love. Boys are told to "not cry," and "be a man," but, they're also human. I want my son to be able to express his emotions, in a healthy way which works for him. I want him to be able to show love; I want him to be kind, generous, and someday, a great husband and father. But, this doesn't start from no where; just like children learn to love reading in the laps of their parents, children can also learn how to love in the confines of their playroom. 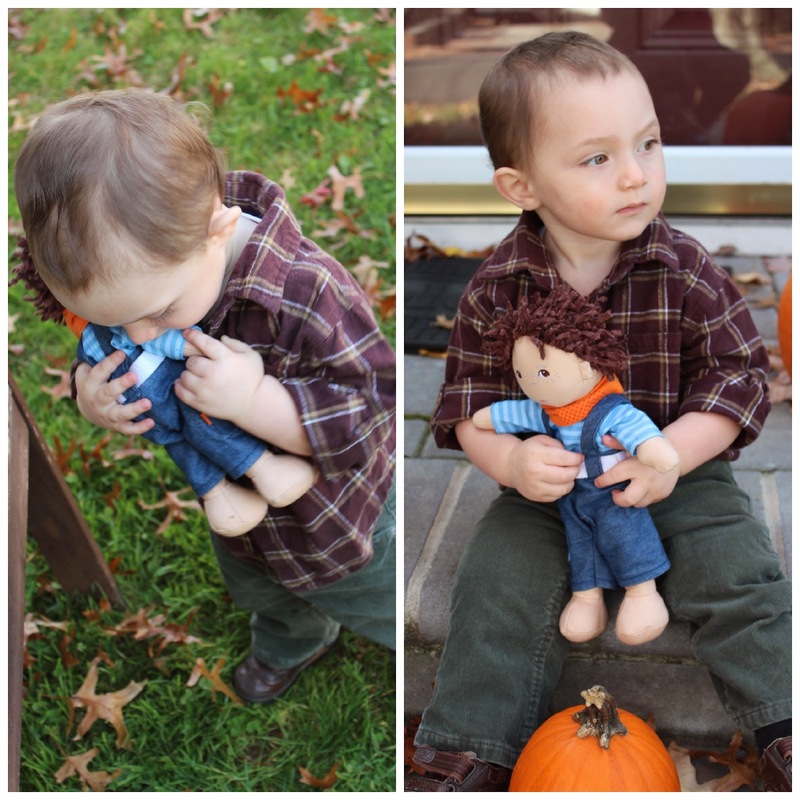 I am so proud of my son for being able to show love and emotion to his doll, and I will always encourage him to keep loving, sharing, and showing emotion. Like the saying says, "the hand that rocks the cradle rules the world," and I want my son to know how to rock a cradle, too, so that he can rule the world someday, as well.